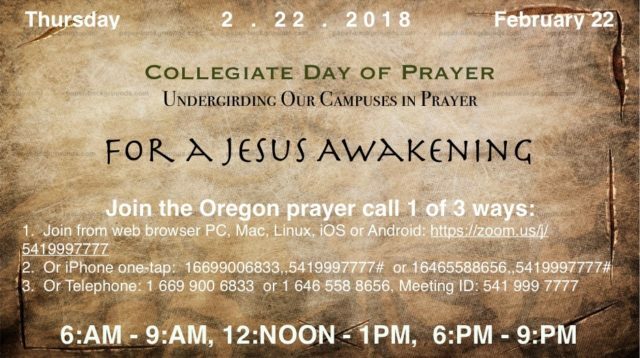 As concerned Oregonians, praying people, parents, grandparents, spiritual parents or friends of a college student, we feel deep concern about our local campuses. For almost 100 years, pastors and church members set aside a specific day to fervently pray and intercede for America’s college campuses. 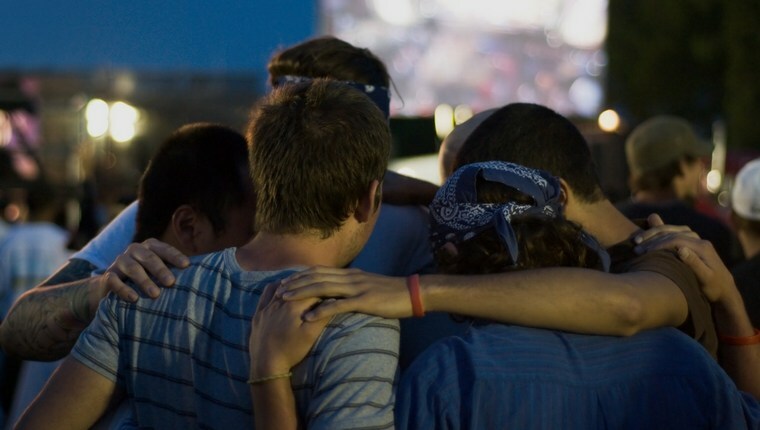 The Collegiate Day Of Prayer is an opportunity for us to unite with like-minded believers across the country and pray not only for our loved ones who attend college, but the broader campus community as well. 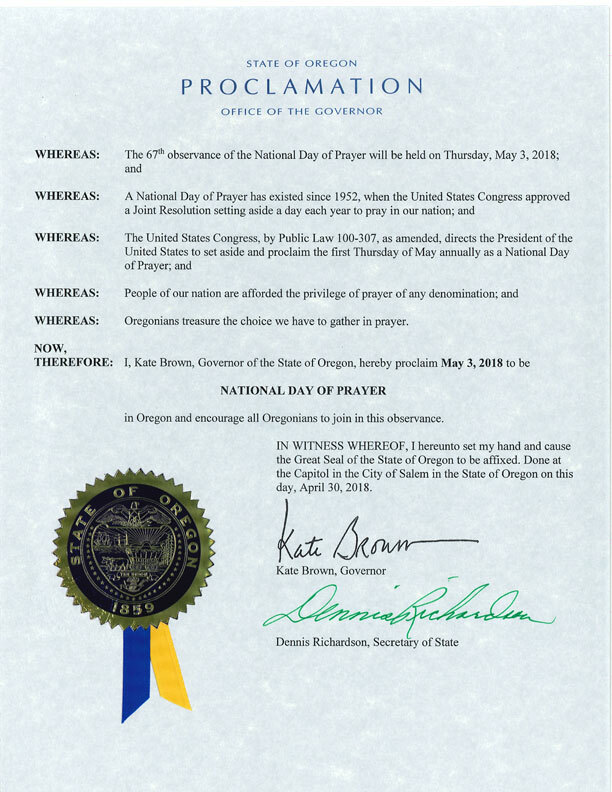 Select the flyer for Oregon to share with your churches and prayer groups. We are asking the Lord for broad participation in the Body of Christ! 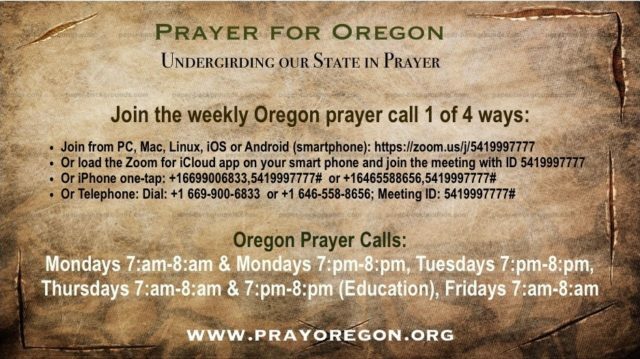 Pray Oregon is inviting you to a statewide prayer call. We are using Zoom, which can be accessed by telephone, smart phone, tablet, or computer. If using a computer, the first time you use the URL link above it may need to download and install Zoom. 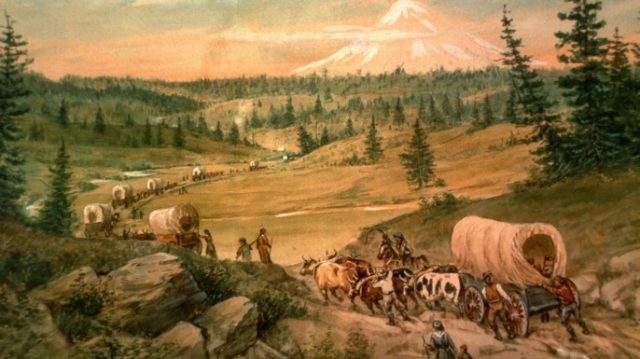 You do NOT need to have your own account, we will be using the Pray Oregon account. You only need to connect to the link. Feel free to try out the connection ahead of time and get familiar with the app on your smart phone or computer. 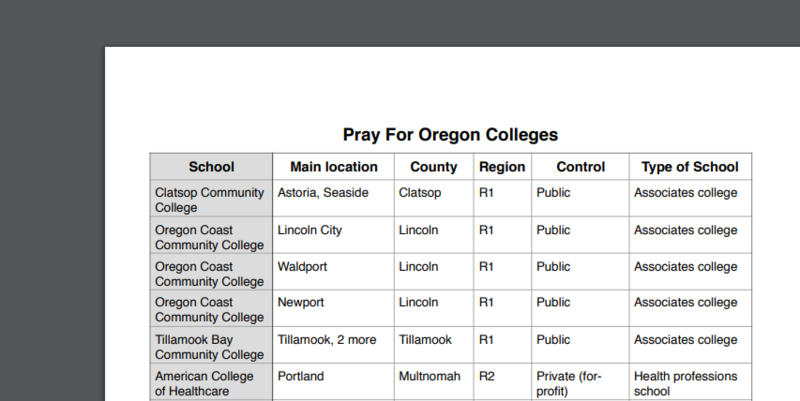 Pray Oregon is delighted to report that of the 100 prayer stakes, (Pray Oregon Staking The Land), we have planted 12 so far, including 6 county stakes. Contact your Regional Connector for more information on staking in your county. We plan to plant more scripture stakes as part of the Spring Tour (April 5th – 28th) so stay tuned. Pastor Steve Buss, One Hope Executive Director and Pray Oregon Connector in Region 4 (Lane County) has graciously provided us with the most recent One Hope newsletter, ‘January 2018 Answers to Prayer’, giving us an exciting testimony of how God’s amazing love and power is moving through Oregon. In other words, the Jesus-following pastors, churches, and people in our area know each other, love each other, and serve together. We trust the outcome of our love and collaboration will be our community seeing Jesus’ love more clearly. Scientists say 50-70,000 thoughts a day pass through your mind every day. So how does it happen that every so often, one thought sticks out among all the rest—so much so that you are convinced that it came from God Himself? I cannot answer how that is, but millions have testified of it happening to them, and I too have had this experience. There are some words, thoughts and phrases that stick out more than others. Word’s from Heaven. For me, these words are on a scale of varying degrees. On one end of the scale, there are words I’m not really sure came from the Lord, but I think they might have. On the other far end of the scale there are words I am so sure came from Him, that I would bet my life on them. And I have. 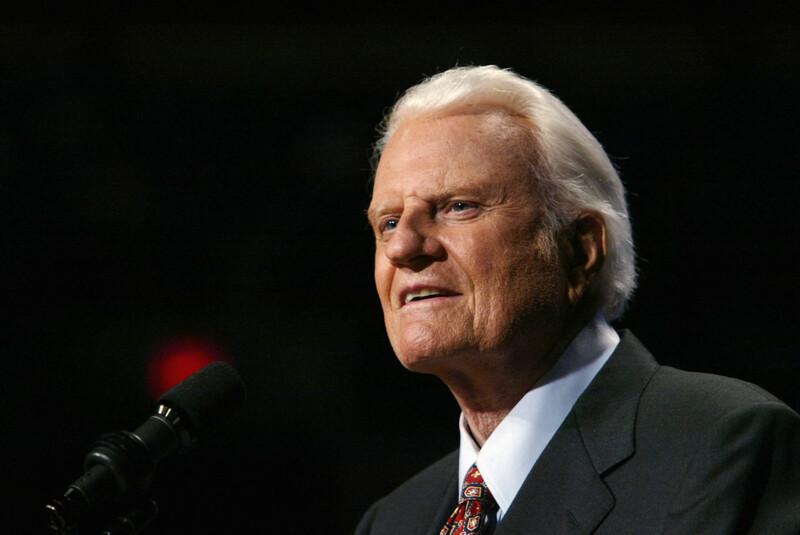 These are the words I acted upon and they have changed the course of my life…and the life of others. Whenever I begin to doubt what I am called to do, or the current direction in life I am to take, I gravitate back to a single phrase given to me in a forest just outside of Silver Creek Falls, near Silverton Oregon. 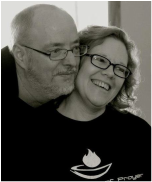 That phrase was: “Help Me find the perfect Bride.” It came to me in such a way, with such clarity and volume in my spirit, that I could scarcely help but believe it was from the Lord. And so, with assurance that it was Divine, I could do nothing but move towards it in obedience. Not many words come to you like this. At least they don’t to me. 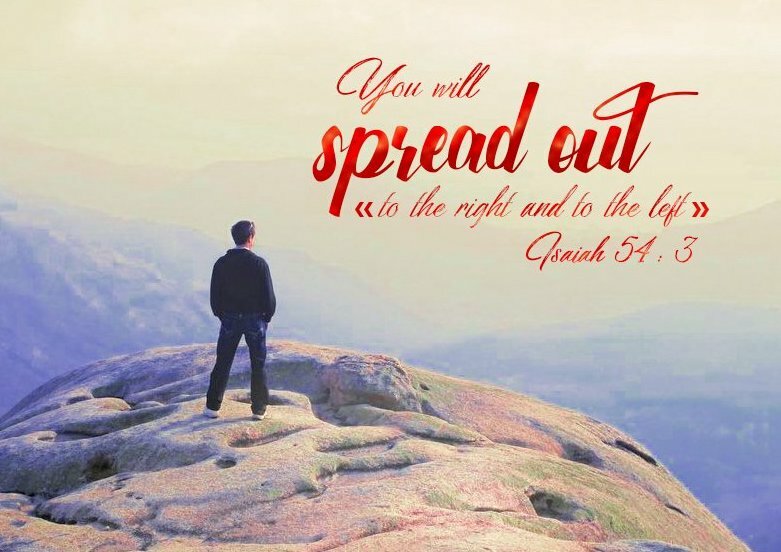 It would be nice if God always spoke with such force and power, but then I suppose it wouldn’t take as much faith, and faith is necessary for us to grow and be refined in our love for Him. The first thing that sticks out to me about this phrase is the word: “Help.” Because God doesn’t really need help, it tells me that He desires partnership. God can do everything pretty well without us. Yet He so values our friendship and fellowship, that we are invited to assist He who needs no assistance. It’s His work, and He wants me to work right along side of Him. Not to work for Him but to work with Him. Kind of like a junior partner in the family business. Then there’s the idea of finding a “Perfect Bride.” This reminds me of the patriarch Abraham, whose servant went looking for a bride for his son Isaac. There are three characters in this portion of the story. The Father (Abraham), the Son (Isaac), and the Servant of the Father. Isaac has long been recognized by Bible scholars as a biblical type of Jesus Christ the Son of promise. God the Father has been searching for a Bride for His Beloved Son for about 2000 years now. He has been doing this through His servant—believers who are of the household of faith. He has gathered people from every walk of life—men and women, young and old, rich and poor, every tongue, tribe, and ethnicity are continuing to make up a gloriously diverse Bride with one thing in common—their love for Jesus the Bridegroom. This Bride will be “perfect” not because she is never weak, or never wrong, or because she never makes mistakes. She is made perfect by the precious blood of the Lamb. 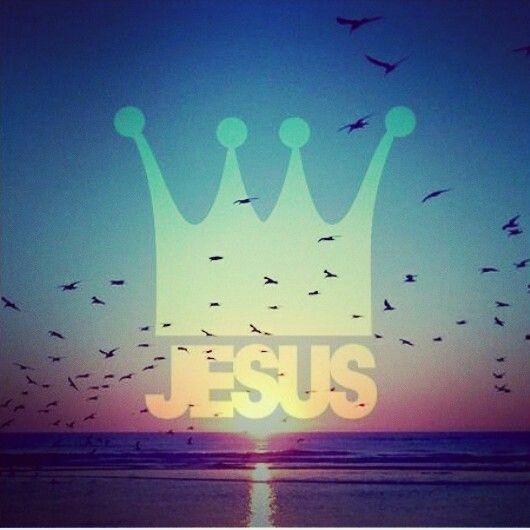 The only perfect One and the only One whose sacrifice that can make us clean. This too we all have in common. Our work is to help this sinless One in His quest. To find a Bride who doesn’t even know she is a Bride. 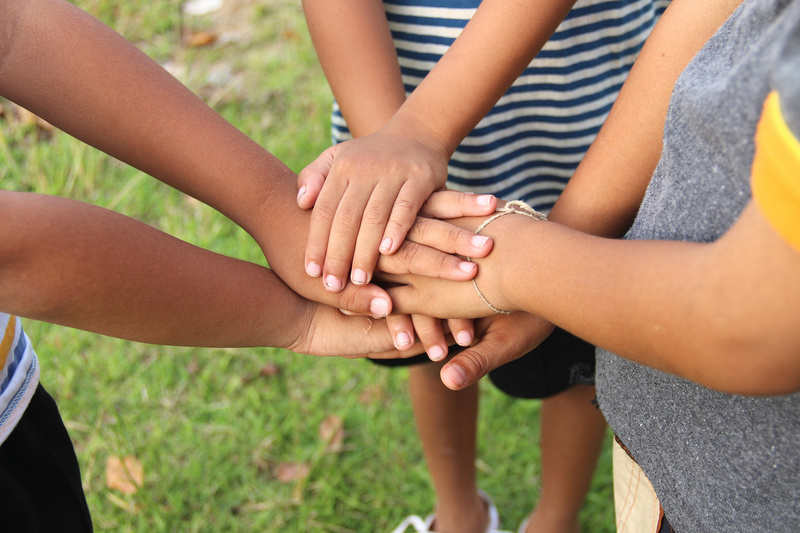 There are many right now in our streets, and schools, and places of work, who are as we were not so long ago, wondering what their purpose in life is, and completely unaware of a God who loves us so much He gave everything to be with them. They are blind to the fact that their true destiny, their yet to be discovered future, is to be a Bride to the God of the universe. Something too good to be true—and yet it is. A real life Cinderella story of one thought unworthy to be loved but loved by a King. Someone called to go from the gutter to the Throne. What could be more important than that? What message rivals that one? So because we love Him, His quest must become our quest too. To search for the treasure He so deserves. To find those who don’t even know they need to be found. To help Him find the perfect Bride.